This article is featured in Accounting Today and Tax Pro Today. On August 8th, 2018 the IRS published proposed regulations (REG-104397-18) that provide guidance regarding the additional first year depreciation deduction under section 168(k) of the Internal Revenue Code (Code). These proposed regulations reflect changes made to the Tax Cuts and Jobs Act (TCJA) to increase the allowable first-year depreciation deduction for qualified property from 50% to 100%. These proposed regulations affect taxpayers who deduct depreciation for qualified property acquired and placed in service after September 27, 2017. If a property is constructed for a taxpayer by another person pursuant to a written binding contract that was entered into prior to the construction of property, the self-constructed rules in the proposed regulations do not apply and the acquisition rule is met on the date a written binding contract is entered. Historically, the taxpayer in this situation would have relied on an evaluation when physical work of a significant nature began. This simplifies the determination of eligibility for the additional first year depreciation deduction. BACKGROUND: The TCJA extended and modified bonus depreciation by increasing the rate to 100% starting Sept 27, 2017, through the end of 2022. It also makes bonus depreciation applicable to both new and used property. This significantly enhances the impact of cost segregation studies by allowing taxpayers who build or acquire improvements to fully expense many assets identified in those studies. The proposed regulations describe and clarify the statutory requirements that must be met for depreciable property to qualify for the additional first-year depreciation deduction provided by section 168(k). 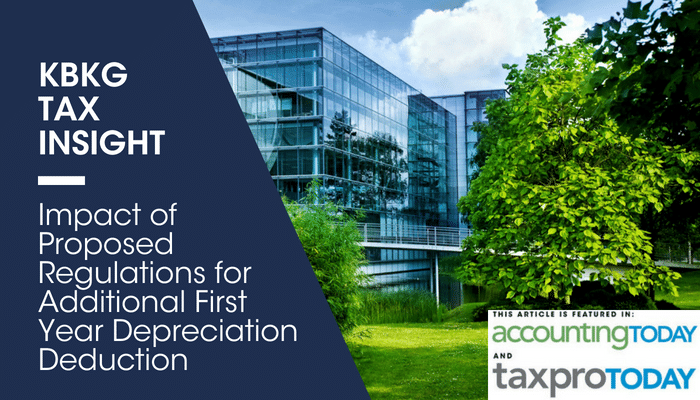 Further, the proposed regulations instruct taxpayers how to determine the additional first-year depreciation deduction and the amount of depreciation otherwise allowable for this property. Because the TCJA substantially amended section 168(k), the proposed regulations update existing regulations in section 1.168(k)-1 by providing a new section 1.168(k)-2 for property acquired and placed in service after Sept. 27, 2017 as well as conforming amendments to the existing regulations. For acquired property, the proposed regulations retain the rules in §1.168(k)-1(b)(4)(ii) defining a binding contract. Therefore, if the written binding contract states the date on which the contract was entered into and a closing date, delivery date, or other similar date; then the date on which the contract was entered into is the date the taxpayer acquired the property. A letter of intent for an acquisition is not a binding contract. Self-constructed property is created when a taxpayer manufactures, constructs, or produces property for its own use. In this situation, the written binding contract rule in section 13201(h)(1) of the Act does not apply. Instead the acquisition rules, per section 13201(h)(1) of the Act, are treated as met for the property, if the taxpayer begins manufacturing, constructing, or producing the property after September 27, 2017. The proposed regulations also provide rules similar to those in §1.168(k)-1(b)(4)(iii)(B) for defining when manufacturing, construction, or production begins; including the safe harbor, and in §1.168(k)-1(b)(4)(iii)(C) for a contract to acquire, or for the manufacture, construction, or production of, a component of the larger self-constructed property. The proposed regulations define qualified improvement property for purposes of section 168(k)(3) before the Act and section 168(e)(6) as amended by the Act. Qualified improvement property acquired and placed in service after September 27, 2017, and before January 1, 2018 is qualified property eligible for the additional first year depreciation. The proposed regulations are silent regarding qualified improvement property placed in service after December 31, 2017. So, for now, the taxpayer is left to assume that such property has a 39-year recovery period and is not eligible for any additional first year depreciation. CONCLUSION: Before these proposed regulations are adopted as final regulations, consideration will be given to any comments that are submitted timely to the IRS. Pending the issuance of the final regulations, a taxpayer may choose to apply these proposed regulations to qualified property acquired and placed in service or planted or grafted, as applicable, after September 27, 2017, by the taxpayer during taxable years ending on or after September 27, 2017.